Transform yourself into this iconic book and film character with this classic Tin Man plus size costume. This silver costume made entirely out of polyester is a plus size version of the Tin Man costume and comes complete with a shirt that snaps closed in the front, and a matching pair of pants with an elastic waistband. 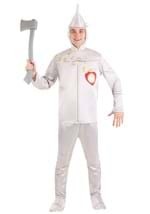 Included with the costume is the Tin Man's trademark cap which comes attached to a hood that slips easily over the head. A pair of silver boot covers attach with elastic bands around the feet and ankles to complete the look. Become one of Dorothy's partners on her quest to see the Wizard.